I finished up a strange book last night, one that I'd randomly encountered in my other reading. 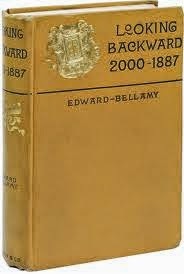 It was the novel Looking Backward, by Edward Bellamy. If you haven't heard of it, well, that kinda figures. It's one of those lost works of fiction, one that was profoundly influential at the time but that has vanished into the mists of history. It's 1873 scifi, meaning it's from the same heady era that gave us Jules Verne. Here was an era when progress was sweeping humanity forward, and society was changing in unprecedented ways. In the thickets of that industrialization, the world was a mess. That sense of purpose, the sense of engagement with history, it was all in flux. With the rise of the robber barons, things were miserable. There was a wild and historically unprecedented imbalance of wealth. The wild swings and irregularities of the free markets left most human beings in poverty, and made wreck and ruin a distinct possibility for all but the richest tiny percentage. Nothing at all like today, in other words. Bellamy reached forward with his imagination, and envisioned a future in which all of that mess had been resolved. The far off year? 2000. In 2000, humanity has figured it all out. Sigh. As he saw it, in that time there was no poverty. There was no war. Bellamy spells that dreamy vision out through storytelling that is very much crafted in keeping with his era. The characters speechify at one another at great length. "What is this new thing," asks the protagonist. "Let me tell you," says the person from the future, "for the next four pages of monologue." It's a different and peculiarly formal way of writing. "As may be supposed, I would have been quite content to waive explanations, but Edith was resolute that there should be no more kisses until she had been vindicated from all suspicion of precipitancy in the bestowal of her affections, and I was fain to follow the lovely enigma into the house." Not quite how things went when the wife and I were dating. In some ways, the society he envisions was modern. Women were equals, fully self-sufficient and independent. Industry was efficient and centralized, with goods being distributed via a central organization that seemed almost Amazon-esque. They used pneumatic tubes instead of drones and UPS, but the idea seemed remarkably close. Shopping was centralized, too, with the thousand tiny stores replaced by one huge one where you could get absolutely anything you wanted. Walmart/Target, anyone? Media was distributed and electronic, meaning that if you wanted to listen to music, you could choose whatever you want and listen to it. Even churches were different. In the year 2000 that Bellamy created, you'd listen to the sermon of your choice, pitched over the network. Faith was entirely net-based, in other words. Every pastor a televangelist, thought I, with some trepidation. So in some ways, he seemed prescient. In others, well, he missed the mark. What was hard, reading the book, was doing so through the lens of history. In Bellamy's 21st century, this had been done by ordering all of society as a single centralized corporation, drawing organizational structure and inspiration from the military. It was all very rational, very scientific, very utopian. Bellamy's ideals--and this bestselling book--gave brief rise to an American movement called Nationalism. The movement tried to figure out ways to further the vision Bellamy pitched out there, which on the surface was hopeful, progressive, and deeply rational. Everyone was equal, wealth had been functionally abolished, as had all of the waste of our struggling against one another instead of working together towards a common goal. But Bellamy's nineteenth century nationalism--mingled with his utopian socialism--just kept echoing though my twentieth century remembrances. A Nationalist socialism, structured like the military? Why did that seem so familiar? That, ultimately, seemed the flaw in reading through this vision of where humanity might head. There was, within it, the assumption that human beings would willingly set down hatred in the name of reason. There was, within it, the idea that power over others would suddenly become something human beings did not want. We'd all just magically work together, because it's so obviously the best thing to do. On the one hand, yes it is. On the other, that has proven far, far more difficult than we human beings have imagined. Perhaps that's why we struggle now with the idea of utopia. Dystopia seems so much more us.